One of my favorite textures is a good crispy crunch, whether it's a hearty potato chip or popcorn to any type of roast skin (think duck or pork). So how could I not love fried chicken? I've been known to save the crunchy chicken skin for last. After stumbling on some recipes for Japanese-style popcorn chicken, I knew I had to try this, especially since the ratio of meat to crunch is higher. The secret to the crunch is something really simple: cornstarch. Next time I plan to tweak the flavor. Maybe I'll try a buffalo bite or a lemon marinade. 1. Place soy sauce, ginger, garlic, and sake in a medium bowl. Add chicken and mix until coated. 2. Refrigerate and marinate for 2 hours or overnight. 3. Pour 1/2 cup corn starch in plastic zip bag. Add a quarter of the chicken and shake until the pieces are completely coated. 4. Remove chicken, tapping to remove excess corn starch, and set aside in a clean bowl. 5. Repeat with the rest of the chicken, adding more cornstarch as needed. 6. Add at least 1 inch oil to a deep cast-iron skillet, Dutch oven, or deep-fat fryer. Bring oil to 350°F. 7. 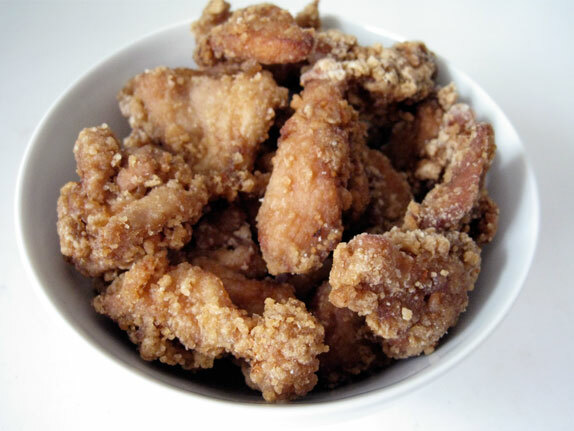 Gently place 10-12 pieces of chicken in oil and fry until golden, about 3-4 minutes. 8. Remove chicken place on paper towels to drain. Repeat with remaining meat.